It’s all in the finishing touches…. Home / It’s all in the finishing touches…. Yesterday was the first day of market in Columbus. The show was quiet but that certainly didn’t dampen our excitement for the beautiful finished models. Dede has a great dimensional fish covered in beautiful coral and seaweed. When finished and mounted on a stand or a board for hanging it is a show stopper. Melissa Shirley cracked me up with this wonderful dimensional crow. Check out the monocle, he’s full of sass. And hanging from his beak is a little ornament. Crows are after all little theives. 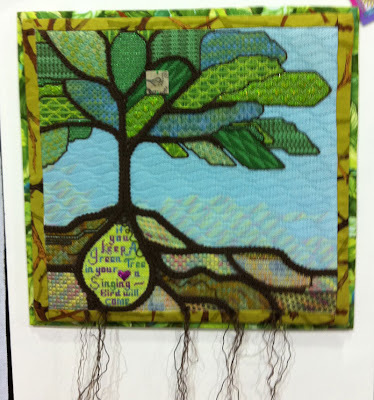 I’ve loved this Barbara Elmore tree since it was introduced. Great spaces for stitches. Barbara stitched and finished this one. Now you know my love affair with all things zecca. 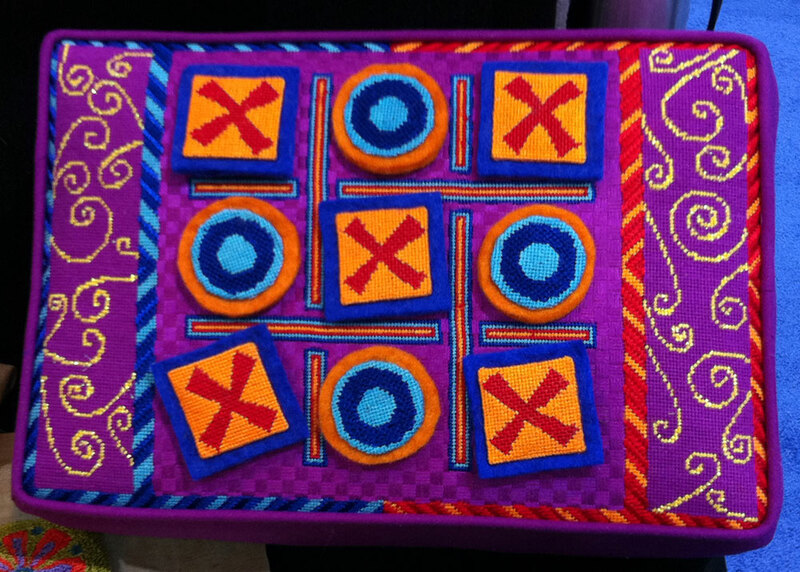 Check out how she finished the tick tack toe board. It’s a pillow and , drumroll please…. there are magnets behind the playing pieces. How cool is that? 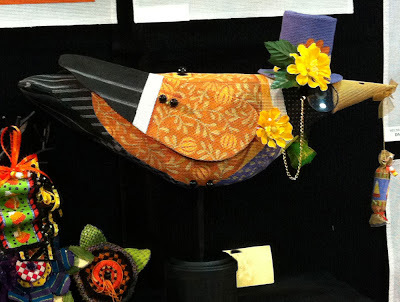 And why not have a needlepoint coo coo clock? Love it! Here’s the Mindy Floral Whimsey stitched and finished. I hear it is going to be in the next issue of Needlepoint Now. 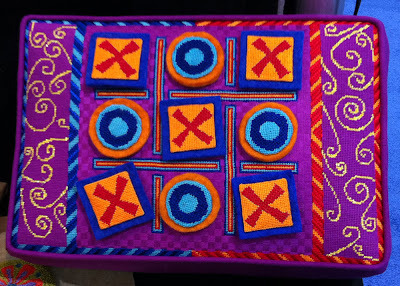 It’s a great piece packed with fun stitches. If you don’t already have it in your stash, you are going to want it when the magazine comes out. 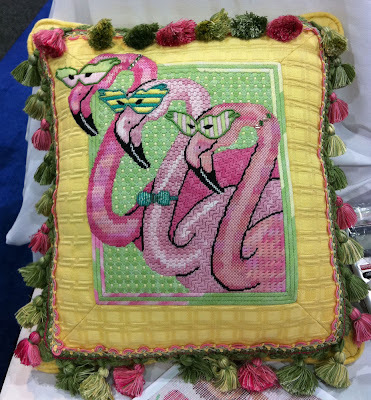 The Collection had this fun loving flamingo pillow. Check out the finishing, the flamingo on the left was appliqued over the yellow pillow fabric. Great idea! Now lets talk super cute frames! 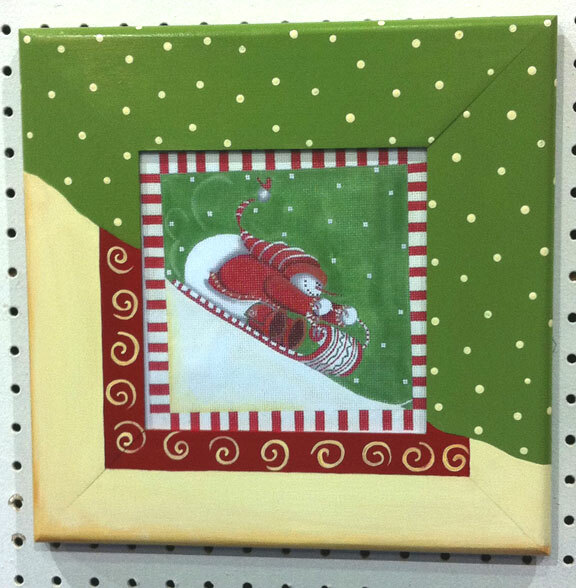 This is a little 5 x 5 design from Maggie in the cutest frame. There are 4 or 5 other bar type designs in this series. All equally fun. 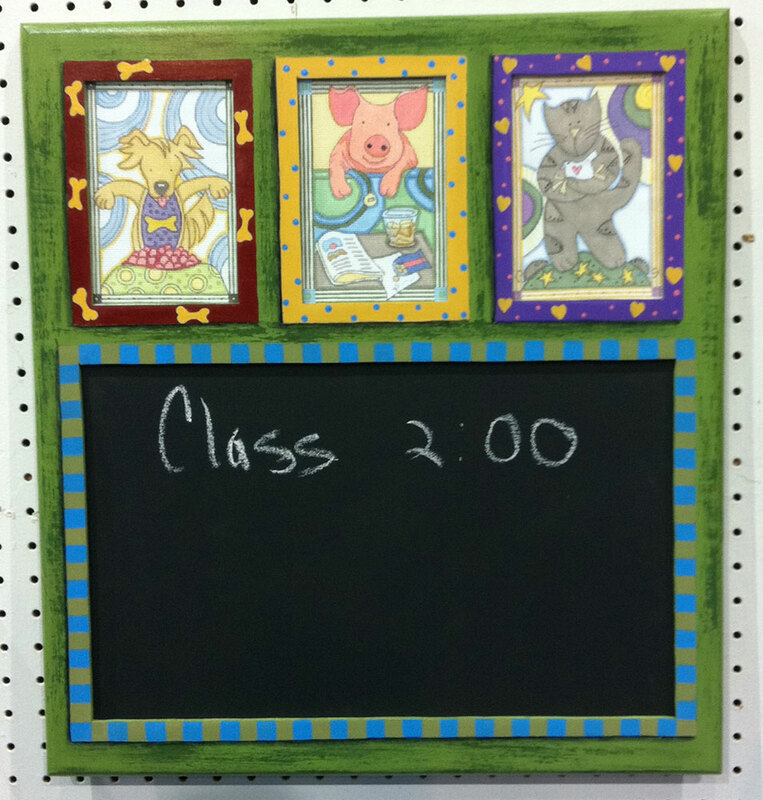 Here’s another frame custom made to show off the Ewe & Eye snowman. There’s a larger canvas from this series called Candy Rush that I’m sure could have a similar frame. I love this concept too. 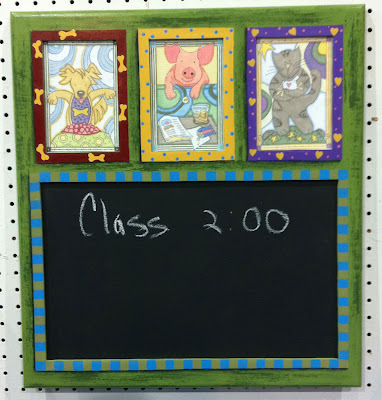 It’s a custom chalkboard so any grouping of canvases could be framed out at the top to make the header. I do love these 3 from Ewe and Eye but you could do any grouping that you like. 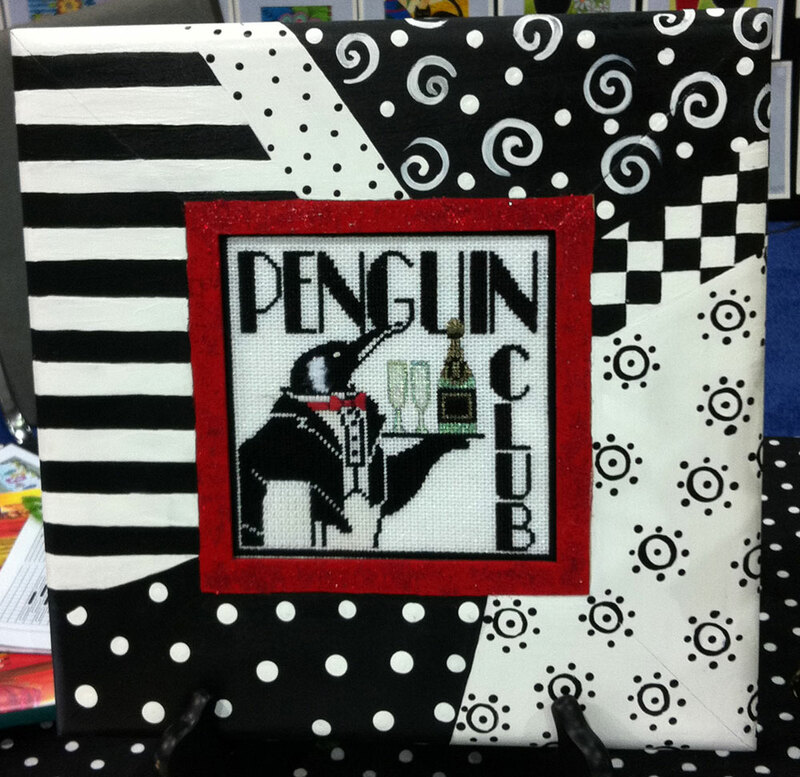 I couldn’t talk about great finishing ideas without mentioning our very own EyeCandy Needleart. Ada has done it again. She took a little oh -so-cute halloween design, stitched it up and finished it as a humbug. What’s a humbug? Well, it’s a funky shaped pin cushion, but you could also finish it as a frame weight simply by filling it with something heavy. 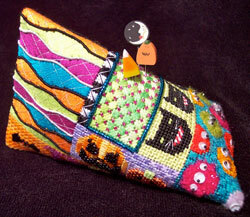 Here’s her little halloween hat finished as a scissor case! Too cute. 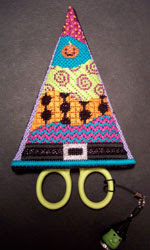 Kelly Clark had the cutest little hanging witch hats. They are only about 5″ tall and since they are half a hat they will stitch up quickly. Speaking of Kelly Clark, we have a surprise for you! I’ll be posting soon, but watch for the announcement of a new club venture between Kelly and myself. Yes, it’s more Halloween, but I promise you will love them! I also promise they are quick to stitch! I better get moving if I am going to find more treasures on the show floor today! I'm drooling!! What fabulous pieces!! Thanks for sharing. Love all the custom frames and the Mindy pillow and of course Kelly's half witch's hat. I agree about the importance of finishing. I probably drive my finishers crazy, especially on the dimensionals. Luckily we now have some incredible finishers!